Figured I may as well give my first impressions of Iceland as well. Amanda’s may have been the toilets at the airport, but mine was the plane! We flew Iceland Air. They had comfortable seats and a good amount of leg room, plus a decent selection of entertainment. I watched Fantastic Mr. Fox (passable) and The Campaign (which, while being an average movie on the whole, had one scene which was so funny that I was crying with laughter, and rewound it just to show Amanda). The seat also had a USB port, presumably for charging devices. The in-flight magazine also said they were getting the planes equipped with wireless internet this year. Soft drink, coffee and tea were complimentary, anything alcoholic you had to pay for. Which is perfectly fine on a flight of less than three hours. So; Iceland Air – two thumbs up! I do have to mention the airport toilets as well though. Everything was so white and minimalistic, I felt like I was in a Stanley Kubrick film. Clean and streamlined, though, I’ll give them that. The other thing I found strange was that there was no separate arrivals and departures area, so on the way to baggage claim I was walking past gates that had people boarding as well as arriving. We picked up our rental car and hit the road, traveling to our destination of Hveragerdi, which is an hour from the airport and about 40 minutes from Reykjavik. Driving here is a bit of a mixed bag. I don’t really enjoy driving all that much, but when I do enjoy it I’m usually on a highway, going fast, not needing to change directions or make navigational decisions, and either happily overtaking people or going a little under the limit and watching everyone else jostle for position. The limit on most UK motorways is 70mph, or 112km/h. Van Failen isn’t the best at high speeds – when he slowly but surely reaches 70mph the steering wheel vibrates so violently that it’s indecent – but he does the job and gets us there, so far without issue. Here they’ve given us a brilliantly sporty little Nissan Micra which wants to blast off the line at the slightest touch of the pedal – pretty much the opposite of what I’m used to with Van Failen. Not only that but in Iceland they have huge stretches of open road that are fairly empty. They’re begging to be driven on at speed. But the speed limit here is 90km/h on sealed roads. When the weather is good, this feels woefully slow, especially after the UK. However their driving conditions can change drastically, and after driving a short stretch in the pelting rain, I was happy for an excuse to do no more than 80km/h. I imagine in the winter time it can get even worse. Driving on the wrong side of the road for the first time definitely made me nervous, but nowhere near the level that narrow and single-lane roads have done in the UK. I have at least played computer games where I have needed to drive in a lawful manner on the other side of the road, so my brain has been put to the task of reversing everything before. Additionally, I’m a very new driver (just shy of two years), so left-side driving isn’t as ingrained in me as it is with Amanda – this makes it easier for me to switch. Anyhow we got to the hotel without incident, and after checking in I went for a wander to scope out the small town, grab a bite to eat and withdraw some cash. 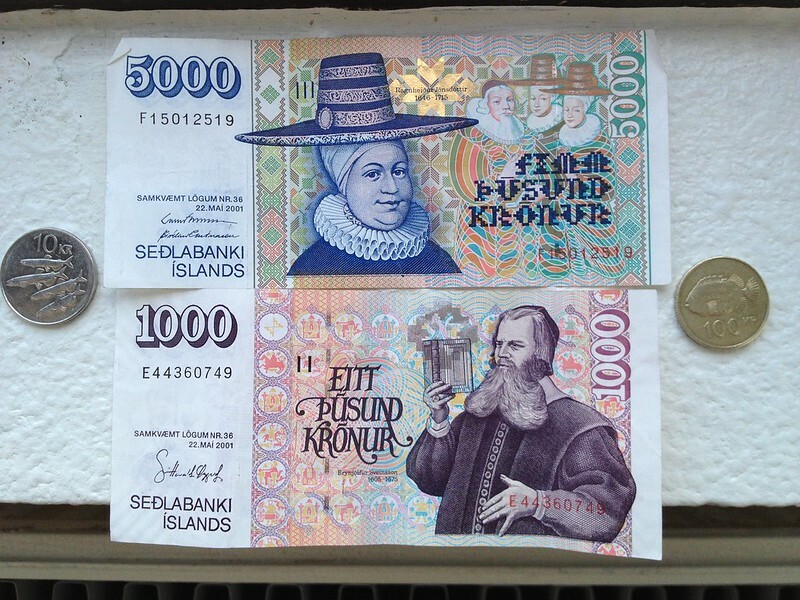 I’m always eager to see new currency, and the Iceland Krona (ISK) is fairly spiffy. The coins all feature different aquatic animals. Currently, it’s 111 ISK to 1 AUD. I purchased a plain hot dog and a bottle of coke from one of the stores here and it set me back 590 ISK ($5.30 AUD). That’s not too bad, but generally speaking the prices of things here are fairly high. We’re going to have to keep an eye on our wallets! Luckily the main thing we want to do is sight seeing, and that’ll only cost us petrol… which costs on average 248.55 ISK ($2.23 AUD) per litre. Lucky it’s a small island! Oh my gosh fish money! That has probably got to be one of the best things I have seen in a very long time. Yes, Fish money! That is so damn awesome. If they have fish stamps too you *must* send me a postcard. It is indeed quite neat! Don’t think they have fish stamps though… see for yourself, they have quite a comprehensive stamps website! A Nissan micra blasting of the line !!!!!! Eddy must be really sluggish to give you that impression. Dad. We’ll have to do a video ep on Eddy in action just to show you the full horror;). I got told (I don’t know whether this person actually knew or not) that the USB ports could be used to watch your own media.